1st October 2009. David & Michelle planning the 2010 ExplorOz National Gathering. New Bob Cooper Outback Survival Products, New Trek - Rason Lake Road. David and Michelle are currently travelling in Wiluna (outback WA) on a logistics planning trip for the 2010 ExplorOz National Gathering. The talks with Wiluna Shire Council and the Gunbarrel Laager has been very successful and they are now headed up to enjoy a few days exploring the eastern side of the Canning Stock Route. You can track their progress LIVE!!! using the prototype version of EOTrackMe. ExplorOz is proud to bring you some outback survival products from Bob Cooper, including:MKIII Mini Survival Kit, Outback Safety And Survival Kit Manual, Play Your Cards Right, Mini Survival Cards, andBob Cooper Survival Pack. Don't leave home without them!! The POV 1.5 Helmet Camera Kit - not just for helmets! This Point-Of-View Recorder comes with it’s own LCD display unit, wireless remote control, and is shock-proof, dustproof, and waterproof (under 1m). Along with the great variety of mounts andaccessories available, the durable camera head can be attached to almost any surface to capture the action, so ensure your next holiday video is from the best point of view - yours! Shop Update - Look what just came in: Camping Guide to SA 3rd edition, the Great Desert Tracks of Australia CD 5th edition, andShrubs and Trees of the Great Victoria Desert. WA born Bob Cooper has been conducting Survival Courses for over 25 years. His Basic and Advanced Outback Safety and Survival Courses have become very successful and popular, as has the Mark III Mini Survival Kit he designed. People who attend these courses have come from overseas, interstate, both men and women, from young to retired. All with a keenness to learn from experts how to have a safer and more enjoyable experience within OZ and abroad, where the same survival principles apply. 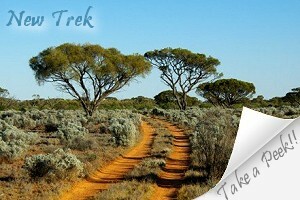 Bob’s Outback Survival Courses are conducted in Perth during April and May – October and November. 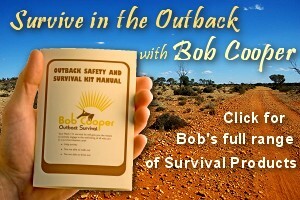 Click forBob Cooper Outback Survival.